French lining pattern 6933 from Butterick. Delineator, June 1914, p. 74. It has princess seams and many neckline options. As far as I can tell, a French lining is a closely fitting interior structure that is usually not the same shape as the finished garment we see. It is different from “flat lining,” or a “dropped in” lining shaped like the dress or skirt, or a coat lining that merely allows the coat to slide over other fabrics more easily. Delineator, June 1914, p. 74. When you have a garment that is tightly fitted, “flat lining” [a lining whose pieces are the same shape as the fashion fabric and are sewed at the same time] will take some of the stress off the seams and the fashion fabric. But when you see a vintage garment that fits very closely in back, but appears to be loosely fitted in front, expect a French lining. Inside this apparently loose-fitting bodice is a tight-fitting inner structure. Vintage garment. This vintage bodice has no visible opening. The tight lining prevents “pull” on the fashion fabric’s concealed closure. When you have a garment that is draped, or bloused, or which has complicated concealed closures, it will behave better with an invisible, body-hugging lining. This vintage dress does not have a visible opening in front or down the back. It does not have a snap opening in the side seam. How do you get into it? Back of vintage lingerie dress. It doesn’t open down the back. Clue: There is a hook and eye closing on the left shoulder. This sheer lingerie dress with a blouson top has a simple French lining made of net. How do you get into this dress? The bias cut lining, which takes the strain of the hooks and eyes, fastens at the center front. The pattern for the inside of the dress is not the same shape as the pattern for the fashion layer. I would class this as a simple French lining. The lining fastens at center front; the fashion fabric layer fastens with hooks and bars at the side and shoulder! The sleeves are attached to the French lining. The skirt opens at side front. The “French Lining” pattern could be purchased separately, but was often included in a dress or blouse pattern. The Commercial Pattern Archive has this Butterick pattern from 1914. Left, the French lining is an 8 piece princess line pattern which fits closely to the body. The French lining was meant to fit very tightly, and is the support for the fashion fabrics. It ensures that the weight of the dress is suspended from the shoulders, that the folds and blousing aren’t pulled out of place, and that the wearer always looks neat as a fashion plate. In No. 7317, the cross-over drape in front ties at center back. These French lining patterns reflect the changing body shape as corsets changed. 1910: Butterick French lining pattern 3527, January 1910. Note the “sway back” shape caused by 1910 corsets. This princess seamed lining has 4 panels in front and 6 in back. 1914: Butterick French lining 6933 from June 1914. The lower bust and larger waist reflect a change in corset shape. 1917: Far right, French lining pattern 1042 from Ladies’ Home Journal, November 1917. The womanly torso is losing its curves. 1924: A French lining pattern from Butterick, July 1924. “…An excellent dress lining or… it can be used to cover a dress form.” It probably was intended for older or “stout” women, since 1920’s dresses were lighter and less structured than previous styles. It has a long, hip-length, waistless shape, like most Twenties’ dresses. Butterick 5361 came in sizes 32 to 48 bust. The French lining is often based on a princess seamed pattern (like all of those above,) since this permits an extremely tight fit, perfectly contoured to the body. (A French lining also looks very much like the covering of a professional dressmaker’s mannequin.) When you are draping on a professional dress form, you can feel the underlying seams through your muslin — very handy for locating the exact bust point or side seam, or placing a dart. Once the French lining was perfectly fitted to a woman’s body, she could also use it to figure out (Oops, accidental pun!) alterations to commercial patterns. Butterick waist 6791; Delineator, April 1914. Incredibly, the Commercial Pattern Archive at University of Rhode Island has the pattern for this waist! (If you just create a Log-in, you can use this wonderful site — over 64,000 patterns and growing! — for free.) There’s always a link to CoPA in my “Sites with Great Information” sidebar. Pattern pieces for Butterick 6791; Commercial Pattern Archive. It’s no surprise that Butterick 7971 includes a French Lining. You can almost guess from the illustrations which garments need a French lining: if you think, “That dress defies gravity! How can that be possible?” or “How did she get into that?” you are probably looking at a dress that has a French lining. Fashion Plate, 1888-1889 from Metropolitan Museum Costume Plate collection. Below the wrapped outer bodice is a concealed side-front closing. There are no visible openings on these late 1880’s dresses. Met Museum collection. They definitely did not have a zipper down the back! A tight fit in back and a concealed opening usually means a French lining; you can probably deduce the rest…. Vintage garment with very full front. The lace was accented with large French knots. It does not have a visible opening in front or in back. Butterick 3816, Delineator, May 1910. Butterick 3816, May 1910. The gathers are stitched to the lining; they won’t slide around or come untucked, and the V’s in back and front will never gape. French lining still exists today, but it lost its name. 🙂 In college we were taught that if your dress has gravity-defying draping or an incredibly large and long V opening front or back, you have to cut the lining close to the body and not following the main pattern. Modern “French lining” forms the inside of the garment, as any other lining, and actually in properly made clothes, the lining is always cut somewhat differently anyway. Better quality commercial patterns still include lining, and the difference is not only in that the facing pieces have been taken off. Mind you, today we have zips. They made it possible to have a concealed closure that can take the strain! Thank you — I sometimes read about couture (I’m thinking Dior, 1947 or so) with “built in corsets” or waist cinches — another adaptation of the same concept. In a tight dress or jacket that buttons in front, a lining that takes the strain off the buttonholes might still be a good idea! I ought to do a short piece about the very useful interior grosgrain belt, too! Janet Arnold illustrated many of them, and I finally borrowed a copy of Patterns of Fashion Vol.2. And the importance of flat lining — never mentioned in the commercial patterns I learned from — was the first Big Thing I learned about making stage costumes…. We used to say costumes were “built” rather than “sewed,” because of their complex interior construction. All this is new to me–thanks! Fascinating – now that you mention it I can see that that blousy front/fitted back construction would have to have a complicated lining! And the shoulder closures – it still seems amazing that those fitted waists could fit over the head and shoulders! Well, they usually have a concealed center front or side front opening, so they don’t drop on like a 1920’s dress. But if we expect the skirt of a dress to open in the same place as the bodice…. not always! How did I attain the age I have and not know this? It makes perfect sense. I have made things like this for costumes and clothes. I have seen the extra pieces in the repro patterns (not labeled as such) and just kinda blown it off because they weren’t in the layout. I have a little red mark on my forehead now, and a deep abiding gratitude. Thank you so much. I do wish there was a website themed: How Did They Put This On? I have an awful feeling that would go another direction I was not anticipating. I had a very educational experience while working on a private vintage collection years ago — but I didn’t take photos of all the steps to getting the outfits on the mannequin — now I wish I had. Some had literally dozens of hooks. There are some very good YouTube videos of “getting dressed in….” that start with the chemise and work outward. Reblogged this on Ernie K Labs. I have only seen women wearing ao dai in movies, but I like any outfit that allows women to wear trousers! I think the ao dai is elegant. To answer your question, a “lining” is inside a dress or coat or trousers. It is not seen except when you put the garment on or take it off. 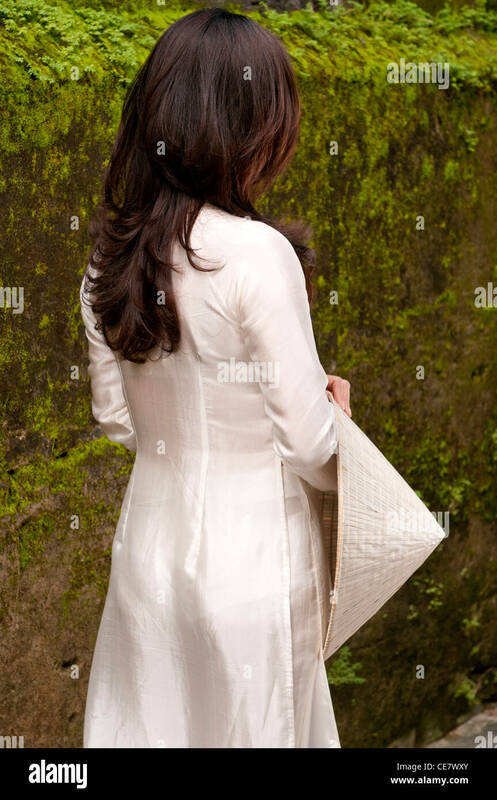 So, the ao dai in the link you sent is not a lining, and it probably doesn’t have a full lining; it’s a dress with long slits at the side seams. The ao dai is probably cool to wear because it does not need a lining. The Fifty Dresses blog is written by a very skilled woman, who likes to use pretty fabrics to line her dresses and coats, even though she will probably be the only person to see the lining. In this post (click here) she shows the inside of a yellow flowered dress with a green lining inside it. When she wears the dress, the lining can’t be seen. This is a wonderful and informative post – thank you. I’ve been fortunate to examine some dresses from this era at our local museum, and recently made a dress for the Armistice Centenary using a French lining – although I didn’t realise what is was called. So although I knew about this and used it, your post is a great explanation of how and why. I was surprised to find several 1914 Butterick patterns at the Commercial Pattern Archive which included the French Lining pieces. CoPA is a wonderful resource, because, if you can see the shape of the original pattern pieces, you can reproduce them by flat patterning or draping on a mannequin (this does take skill and training!) I’m not sure this link will work, but it will if you log in to CoPA –it’s free.